Perfect for windows, balconies or decks. With optional hanging cleats, can be hung from any wall. Available in any size. Just choose from the size ranges below and enter exact dimensions in Comments/Exact Dimensions box in More Options. 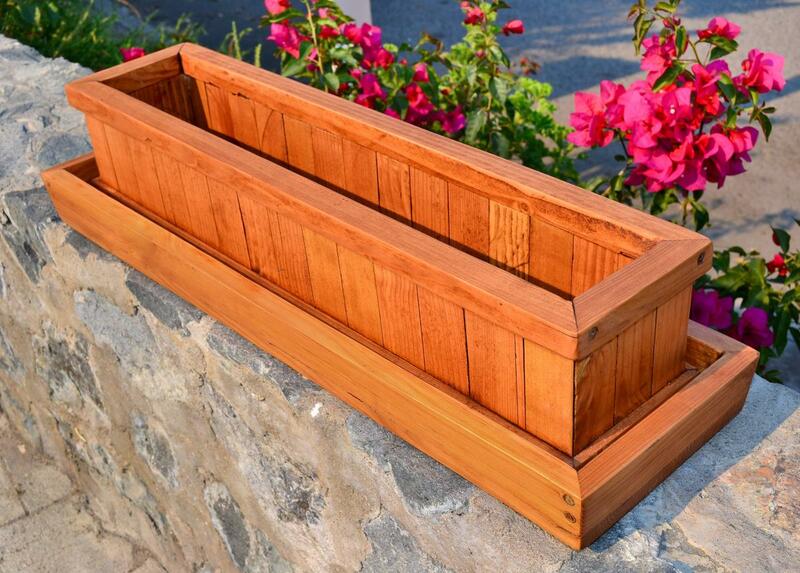 Crafted to be the last window boxes you'll ever buy. 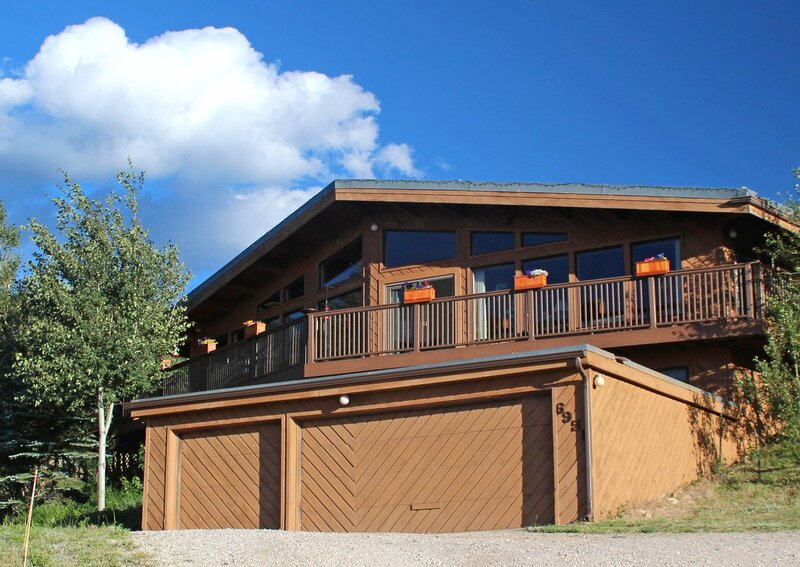 Extra thick Redwood walls - more insect and rot resistant than either cedar or teak. Ships assembled and ready to add soil. Drainage holes pre-drilled. Finely sanded and sealed. No liners needed. 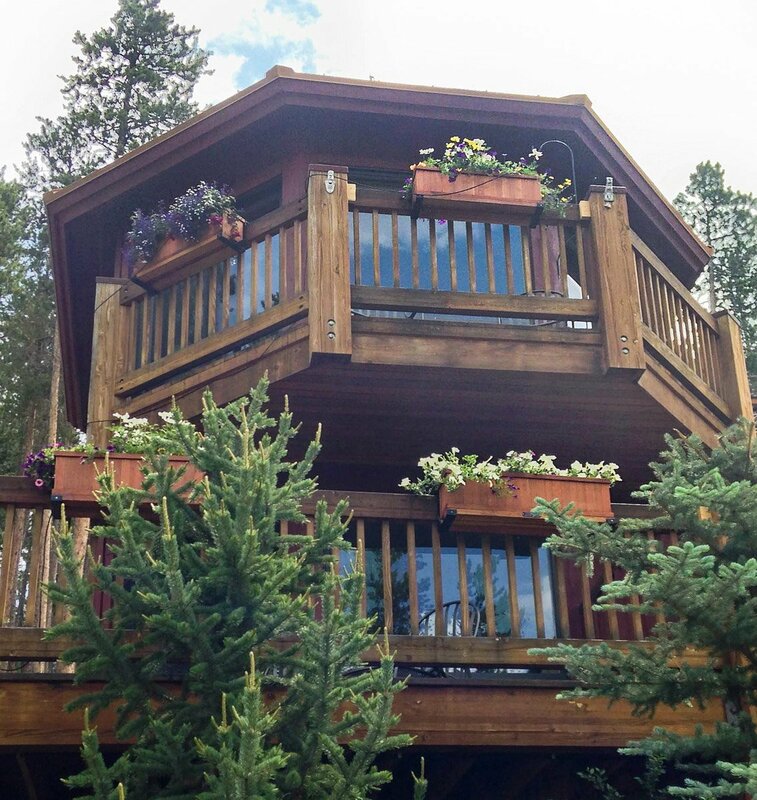 Framing is 1 1/8" wide and 1" tall both on the top and bottom. 6 x 6 x 4.5 4.5 x 4.5 x 4 1/3 Gal 2 lbs. 7 x 7 x 4.5 4.5 x 4.5 x 4 1/2 Gal 3 lbs. 7 x 7 x 7 6 x 6 x 6.5 1 Gal 4 lbs. 8.5 x 10 x 10 6.5 x 9 x 9 2 Gal 5 lbs. 10 x 7 x 5.5 8.5 x 5.5 x 5 1 Gal 4 lbs. 10 x 10 x 10 8 x 9 x 9 2.5 Gal 5.5 lbs. 14 x 10 x 10 12 x 9 x 9 5 Gal 10 lbs. 17.5 x 7 x 5.5 16 x 5.5 x 5 2 Gal 5 lbs. 27 x 7 x 5.5 25.5 x 5.5 x 5 3 Gal 6 lbs. 36 x 7 x 5.5 34.5 x 5.5 x 5 4 Gal 8 lbs. 44 x 7 x 5.5 42.5 x 5.5 x 5 5 Gal 10 lbs. 54 x 7 x 6.5 52.5 x 5.5 x 6 7.5 Gal 12 lbs. 62 x 7 x 7.5 60.5 x 5.5 x 7 10 Gal 14 lbs. 72 x 7 x 7.5 70.5 x 5.5 x 7 14 Gal 16 lbs. 84 x 7 x 7.5 82.5 x 5.5 x 7 16 Gal 18 lbs. 96 x 7 x 7.5 94.5 x 5.5 x 7 18 Gal 21 lbs. 108 x 7 x 7.5 106.5 x 5.5 x 7 21 Gal 23 lbs. 120 x 7 x 7.5 118.5 x 5.5 x 7 23 Gal 26 lbs. 12 x 8.5 x 8.5 10 x 6.5 x 8 3 Gal 6 lbs. 17.5 x 8.5 x 8.5 15.5 x 6.5 x 8 4 Gal 8 lbs. 24 x 8.5 x 8.5 22 x 6.5 x 8 6 Gal 12 lbs. 36 x 8.5 x 8.5 34 x 6.5 x 8 9 Gal 14 lbs. 48 x 8.5 x 8.5 46 x 6.5 x 8 11 Gal 21 lbs. 60 x 8.5 x 8.5 58 x 6.5 x 8 14 Gal 26 lbs. 72 x 8.5 x 8.5 70 x 6.5 x 8 17 Gal 29 lbs. 84 x 8.5 x 8.5 82 x 6.5 x 8 20 Gal 32 lbs. 96 x 8.5 x 8.5 94 x 6.5 x 8 25 Gal 35 lbs. 108 x 8.5 x 8.5 106 x 6.5 x 8 29 Gal 39 lbs. 120 x 8.5 x 8.5 118 x 6.5 x 8 32 Gal 43 lbs. 24 x 10 x 10 22 x 8 x 9.5 8 Gal 13 lbs. 36 x 10 x 10 34 x 8 x 9.5 12 Gal 18 lbs. 48 x 10 x 10 46 x 8 x 9.5 15 Gal 24 lbs. 60 x 10 x 10 58 x 8 x 9.5 19 Gal 28 lbs. 72 x 10 x 10 70 x 8 x 9.5 23 Gal 35 lbs. 84 x 10 x 10 82 x 8 x 9.5 26 Gal 41 lbs. 96 x 10 x 10 94 x 8 x 9.5 30 Gal 46 lbs. 108 x 10 x 10 106 x 8 x 9.5 40 Gal 51 lbs. 120 x 10 x 10 118 x 8 x 9.5 44 Gal 57 lbs. 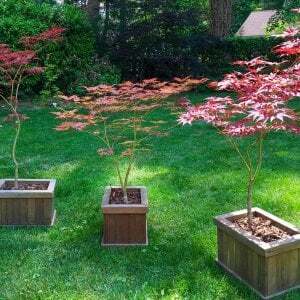 Planters are available in any size or style. 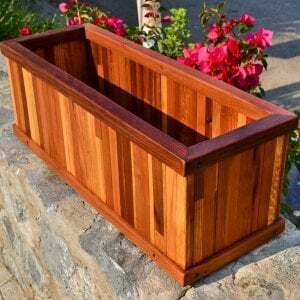 Learn more about custom planter sizing or contact us if you want a style that you don't see. 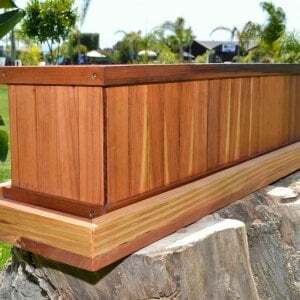 If you’d like to elevate your box more than 1”, we can add a stand for you for a small additional charge. Stands are available in 6” increments to any size you need. NOTE: To maintain stability for a free standing box, it is best to keep your total box and stand height at or below double the box width. 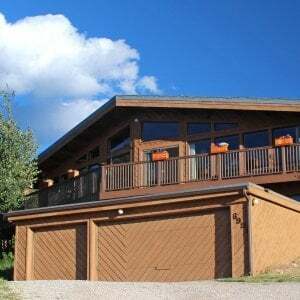 You can exceed double the width stably if you can support and attach the box and stand to a wall or other structure. 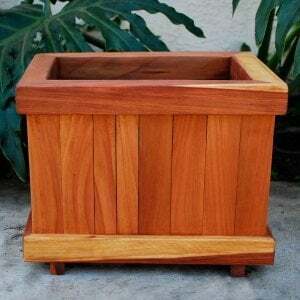 Napa Planter in Redwood 48” L x 18” W x 18” H with 12” H stand and 36” H trellis. 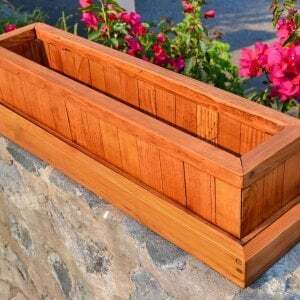 Want to hang your planter on a wall? We offer hanging cleats for planters up to 144"L x 12"H x 12"W the cleats are made with the same wood grade as your planter. Cleats ship with the male portions attached to the planter. 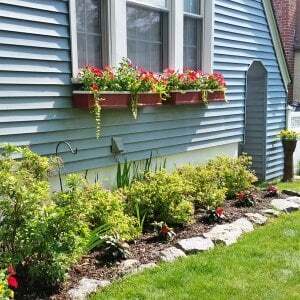 We ship the female cleats looseand include stainless steel screwsso that you can attach them into your wall before hanging the planter. We'll attach two, three or more cleat pairs depending on the planter size, but your cost for the cleats is the same: $15 total per planter. 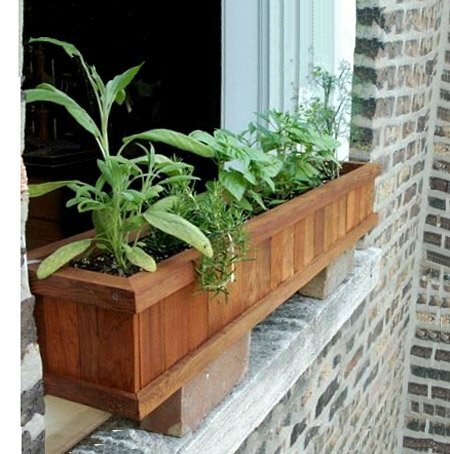 We can add 3/4" strips of wood under any window box planter so that it will straddle your balcony railing. Balconies often have railings 4 to 5 1/2 inches wide. 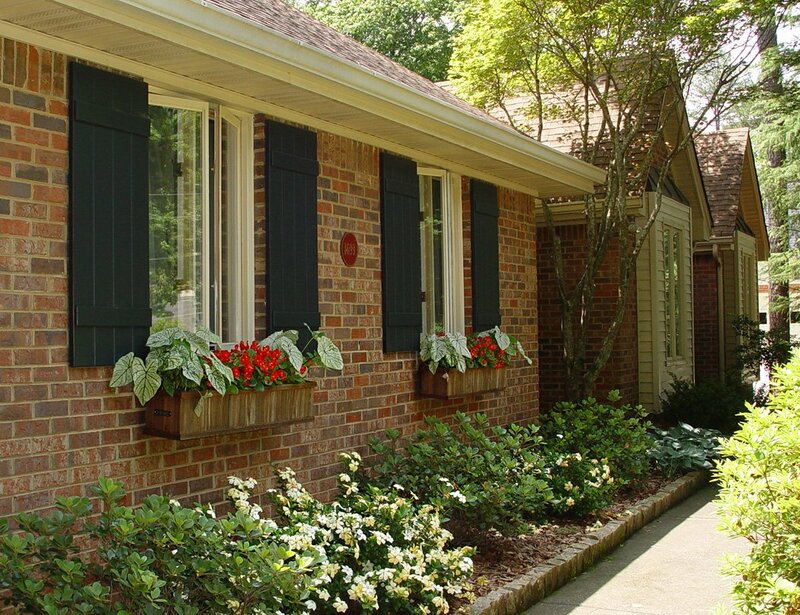 We can add the wood strips per your required spacing down for a snug fit. The charge is $10 regardless of the strip spacing or length of your planter. 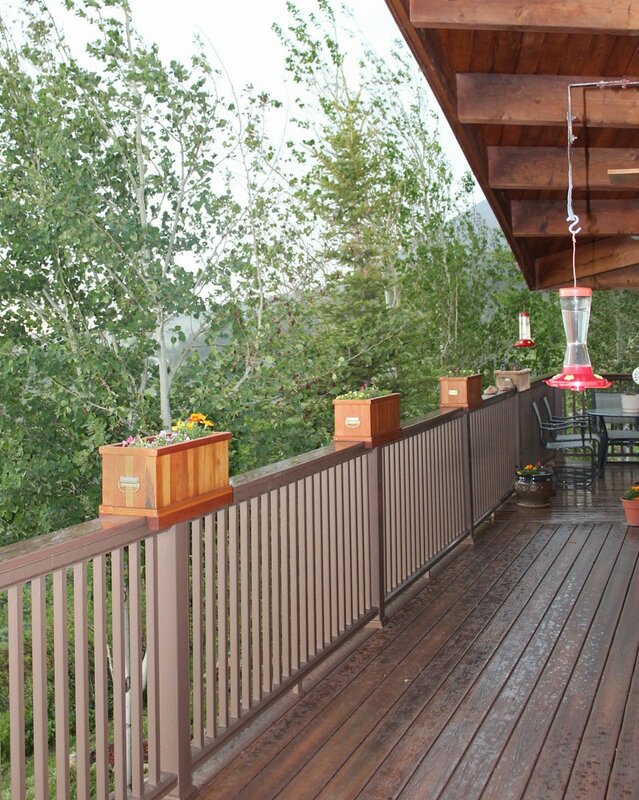 Just let us know in the comment box the spacing you'd like for the deck rail mounting wood strips and consider it done! 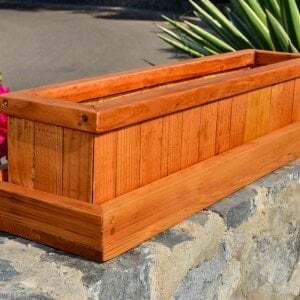 We can make Water Trays for planters in any size that you need. 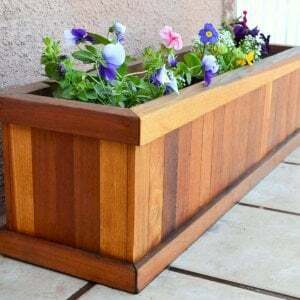 They can be made to sit outside the planter box as shown, or for larger planters, they can be built to sit inside the box where you can place potted plants. 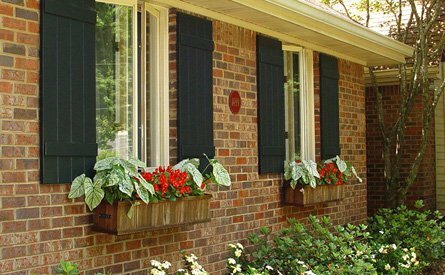 You can use these planters indoors as well as outside. 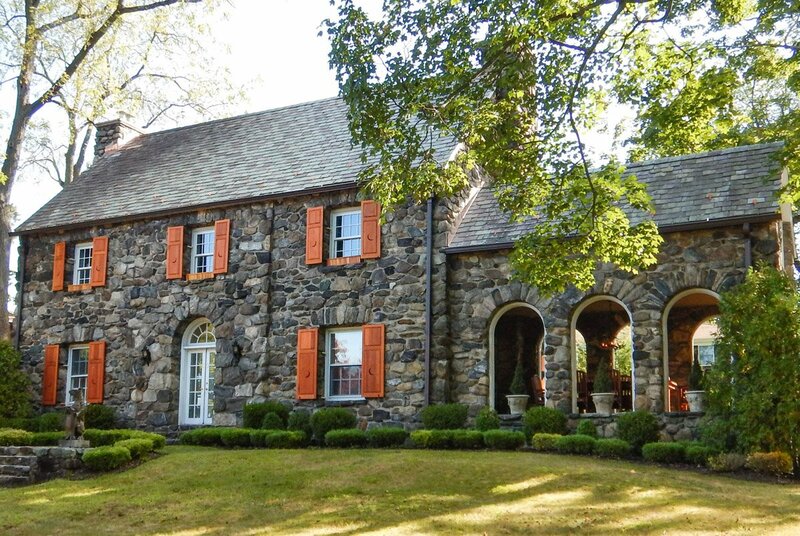 Click on the photos at right for more information. 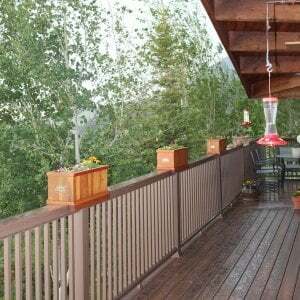 Growing Veggies? 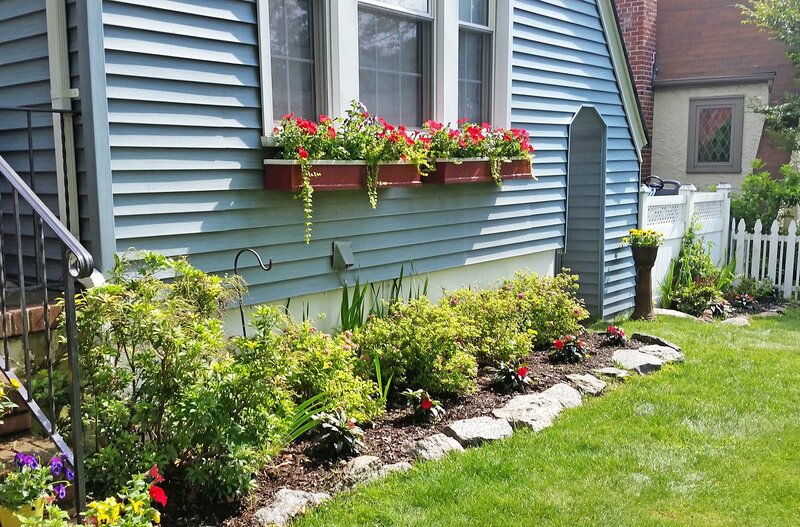 Over the years, some customers have expressed concern about the possibility of getting wood sealant into the soil where they plan to grow food. If you share this concern, let us know. 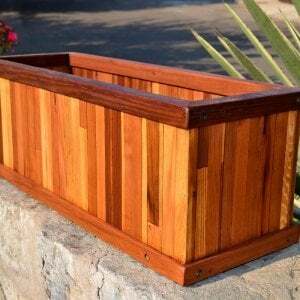 Any planter can be ordered without interior sealant treatment. Just write us a note as you're checking out in the comment box and we will not use our oil-based sealant inside the box. We will seal the box on the outside only. 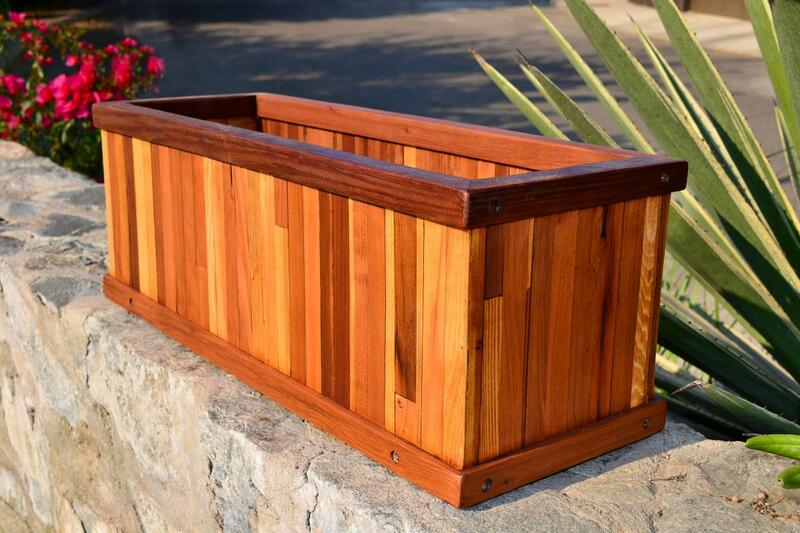 The planter box will not decay for many years without an interior sealant despite the constant moisture because of the high quality wood we insist on using for all our products. 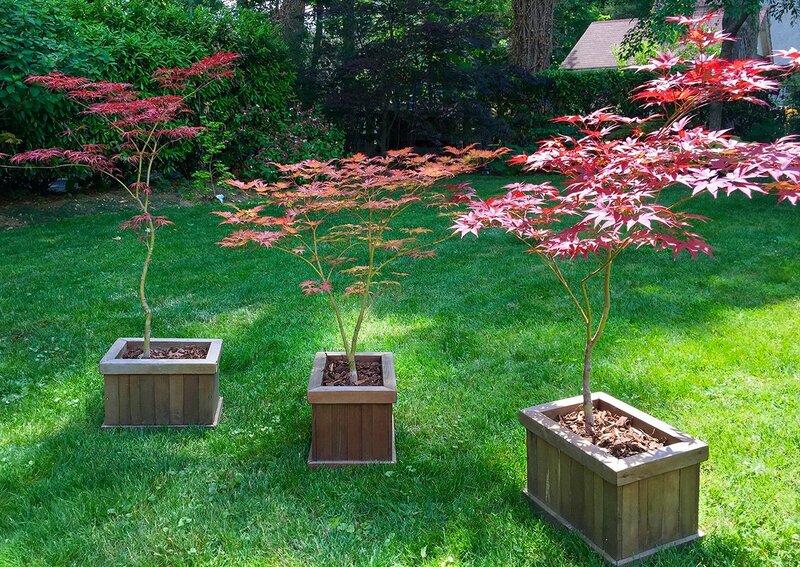 Redwood is so decay resistant that our planters do not need liners of any kind. 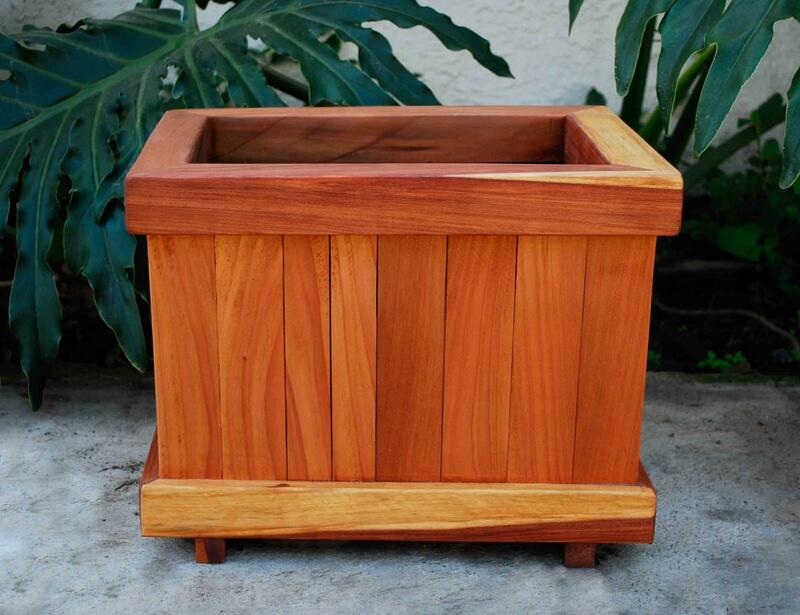 Our planters are built with extra-thick high quality Redwood and fastened with stainless steel bolts and deck screws. There is nothing to decay, nothing to rust. 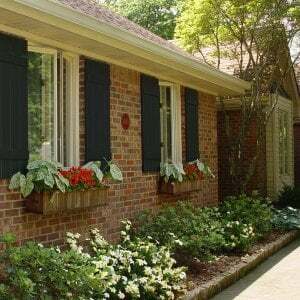 Planter bottoms are elevated one inch off inside the walls for easy drainage. 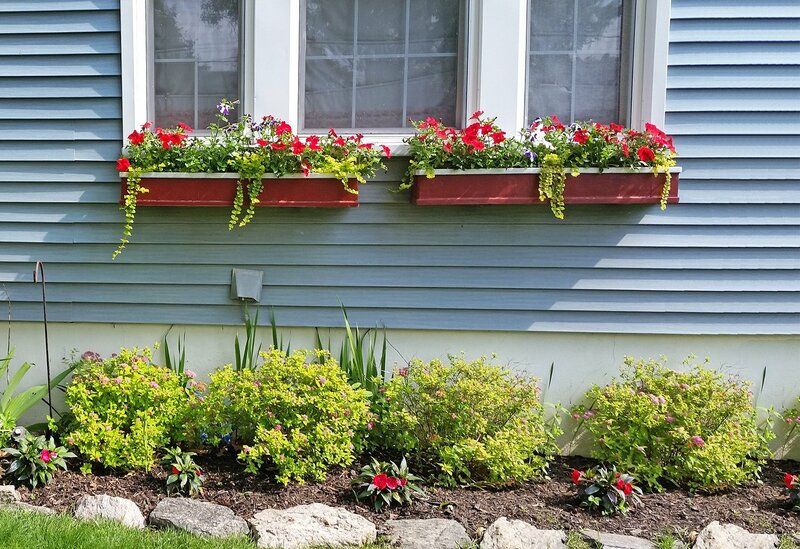 You can add soil directly into the planter box-no pots, interior liners or sealants are necessary. Drainage holes are 1/4-inch round and are scattered generously over the planter bottom. 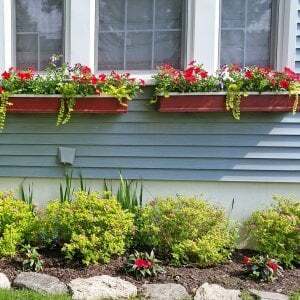 All planter sizes are overbuilt to prevent bulging or sagging. 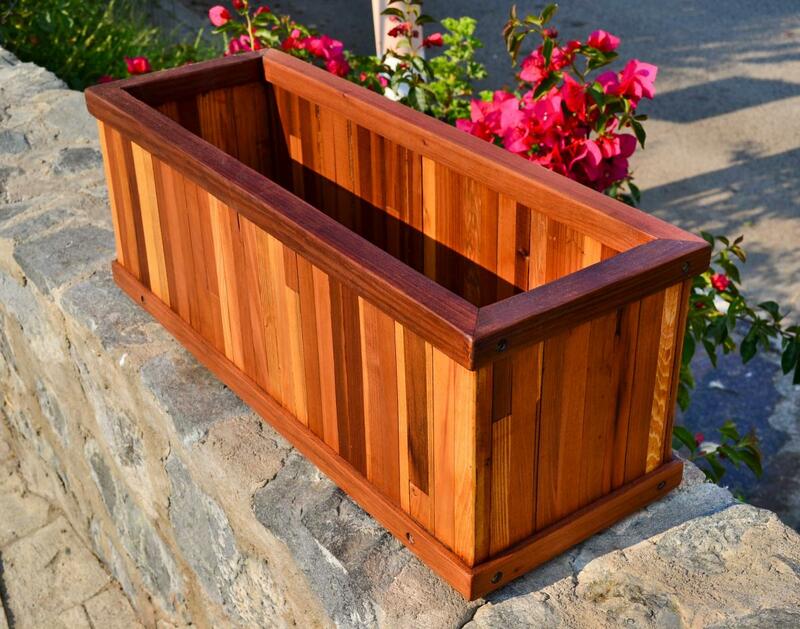 We can custom build and ship Planter Boxes in any dimensions up to 14-Feet long anywhere in the U.S. 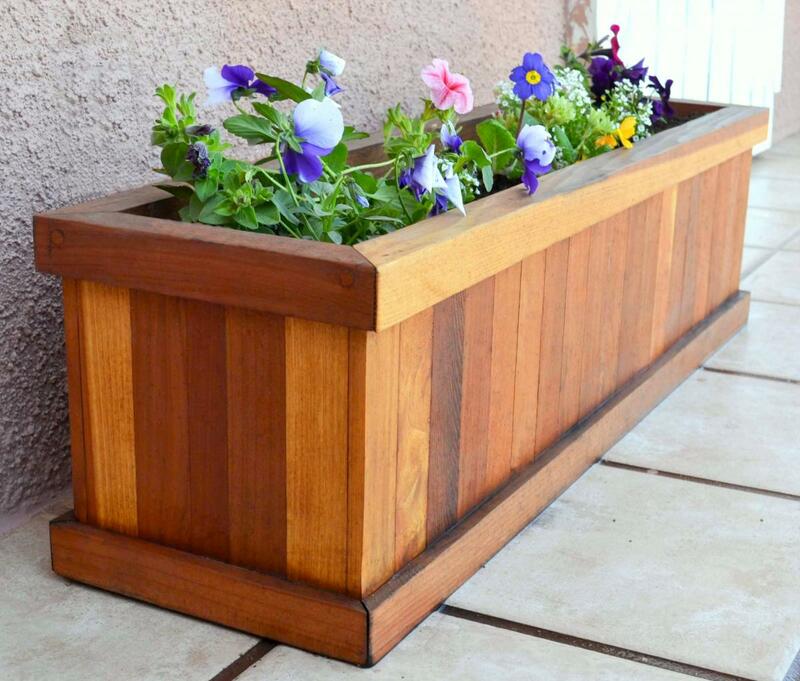 In California we deliver planter boxes up to 20-Feet long. 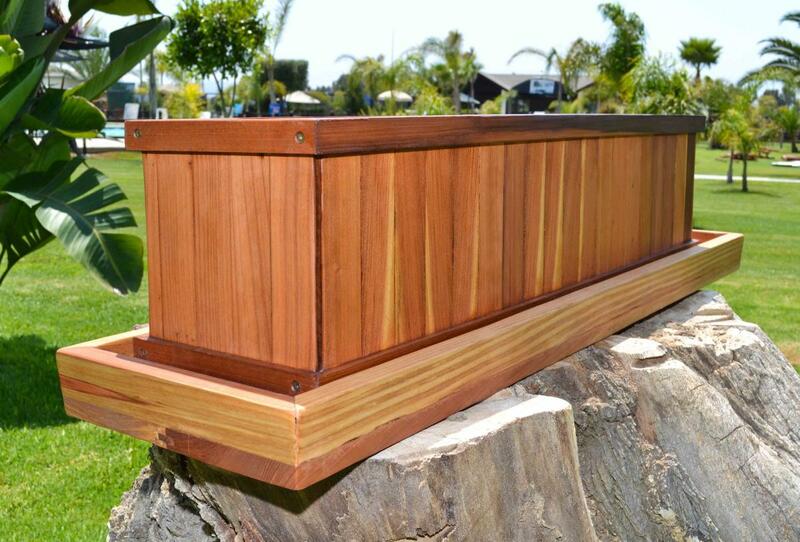 (If you live outside California and want a planter over 14-feet long, please contact us for a quote.) Most packages ship via FedEx Freight. 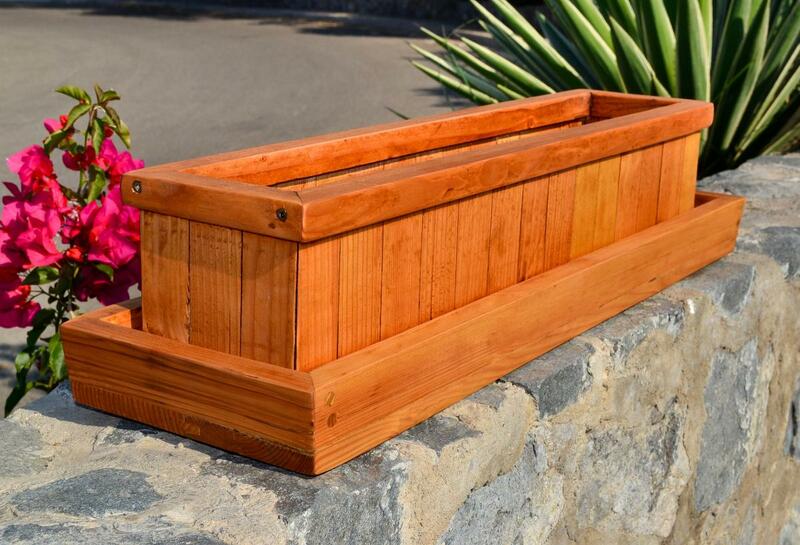 See how easy it is to assemble our planter boxes! 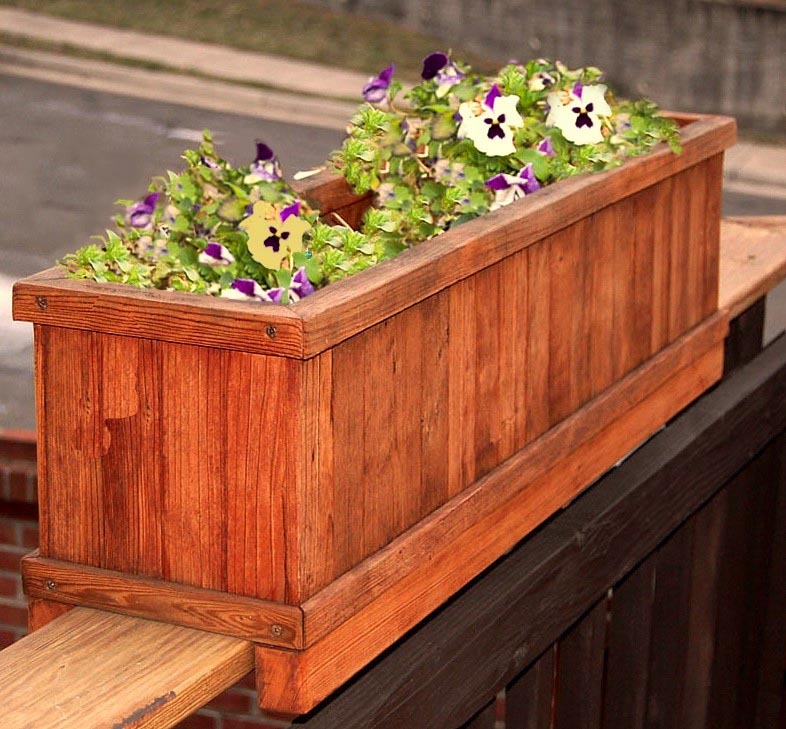 The Window Box Planters ship fully assembled. Just unpack and enjoy.